Brick City Cross Stitch - Cross Stitch Designs and much more! A total of 1 records matched your search. 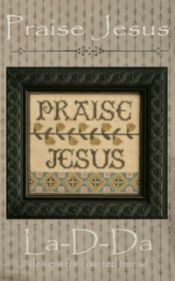 Praise Jesus from La-D-Da is stitched on 32 count Parchment from Weeks Dye Works or a fabric of your choice with a stitch count of 89w x 78h using Needlepoint Silks with DMC alternative.